When getting a new nose piercing or a piercing period, it is always important to know the risks that are involved. While several risks can be mitigated by proper care and proper procedures taken by the piercer, there are always risks like infection and complications. After a long arduous process of weighing the pros and cons, you've finally decided that you want to get your nose pierced. Before planting your derriere in the piercer's seat, you need to think about the type of piercing that you want to get and the potential risks that might be involved. Because as with anybody modification, nose piercing involves some risks. Before you can know the potential dangers of piercing, however, you need to know the types of piercing that happen in the nasal cavity. The two most common ones are the nostril, or the fleshy side of your nose, and the septum, the area between the nostrils that contains cartilage. While there are other areas of the nose that do get pierced, these are the most common. Now that you know where to pierce, it's important to understand the dangers associated with both. Infection is a common problem that can happen in both the nostril and the septum. According to the American Academy of Family Physicians, Staphylococcus bacteria are common in the nasal cavity and can cause infections in this area. Signs of infection can include swelling, tenderness, pus, persistent pain and aching, and abnormal bleeding, especially in an older piercing. Abscesses or bumps are also another sign that an infection might be present in a nasal piercing. Due to the type of bacteria in your nose, you will want to visit your doctor immediately if you suspect an infection to get a round of antibiotics, according to the AAFP. An infection to the septum, and in lesser cases, to the nostril, can lead to necrosis, or death of the tissue, in the nasal wall. This can leave the person with a mild to severe deformity as the tissue must be removed. These lesions can be caused by a bacterial or fungal infection, according to the Kathleen T. Montone, MD in Differential Diagnosis of Necrotizing Sinonasal Lesions (page 1 & 2). Therefore, you can find this in both a new and older piercing that has been improperly cared for. Another deformity that can be caused by an infection in a septum piercing is a perichondritis infection typically stemming from the bacteria Pseudomonas aeruginosa. In a perichondritis, the perichondrium, the connective tissue found in cartilage, becomes inflamed and infected. Without proper treatment with antibiotics, this can cause tissue death and require surgical removal. 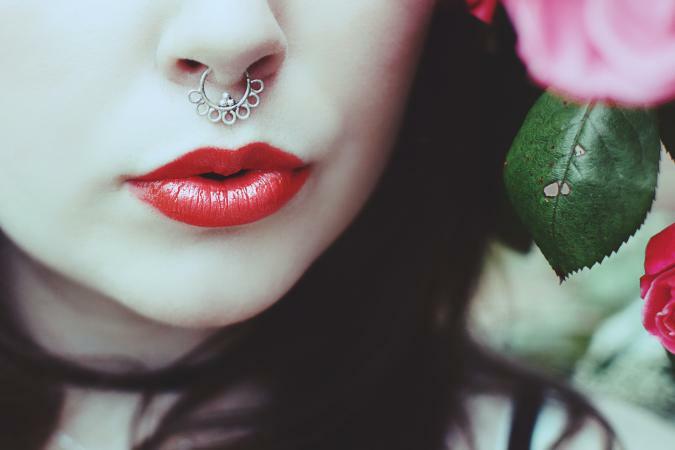 A piercing in the septum can lead to a septal hematoma, which is where blood collects between the nasal septum and the perichondrium. A hematoma in this area will need treatment because it can cause a loss of blood supply to the nasal septal and destroy the tissues. Symptoms of this condition include both pain and swelling as well as difficulty breathing. You use your nose to breathe. Therefore, if you put jewelry in an area you use to breathe, there is always the possibility that you will aspirate or swallow the jewelry in your nasal or septum, even in your sleep. As with any piercing, your body might choose to reject the metal you are putting in it. Not only can your body actually push the metal out of the skin, but it could absorb the metal, causing the skin to grow around it. This could lead to infection and/or require surgical removal of the jewelry. Another danger of this type of piercing is trauma. Nasal piercings, especially those in the nostril, can get ripped out. This could lead to trauma of the skin or for the back to become embedded within the nasal wall. While there will always be a risk of danger when piercing your body, there are several ways that you can minimize the danger of piercing your nose. While piercing your nose yourself might seem like a good idea, a professional piercer has the right equipment and training to properly pierce your nose. Additionally, the facilities and equipment that they use will be sterile, and they will properly prepare the area for piercing. By piercing your nose yourself, you are opening the area to several additional risks from unsterilized equipment and improper procedures. This could increase your risk for developing infections, along with other complications, and it could also lead to a more painful experience. Before going in to get your nose piercing, ensure that the shop you use is clean. Make sure the piercer washes his or her hands and uses disposable gloves. The tools they use should also be sterilized and properly disposed of. You might also look for specific certifications like those from the American Red Cross. In addition to not being sterile, a piercing gun uses blunt force to shove the ring through the nostril, while a needle is a specialized tool with a hollowed-out hole that will actually remove a small area of flesh. This will provide much less trauma to the area and allow for faster healing. After getting a nose piercing, ensure that you follow the aftercare instructions provided by your piercer. This includes cleaning the area properly and ensuring that all jewelry is secured properly. You will also want to watch the area for signs of infection. While all new piercings will be tender and swollen, prolonged swelling and tenderness could indicate a problem. It is important to know any allergies that you might have to specific metals before getting a piercing. Your body can reject a piercing if you are allergic to the specific metal, but generally surgical steel, titanium, platinum and solid gold are nontoxic. Even with an established piercing, you want to ensure that you clean the area properly with antibacterial soap at least once a day when you would normally wash your face. It is also important to check the jewelry to ensure that balls and backs are tight. This can help to lessen the risk of jewelry falling out or being sucked up your nose. Piercing your nose can come with several complications, like infection, rejection, and even physical deformity, but if you follow your aftercare instructions and take care of your piercing, you can mitigate the risk. While there isn't any way to fully overcome the dangers, talking with a professional and ensuring the shop is clean and sterile can go a long way to keeping you safe. It is also important to wash and check the jewelry to ensure that everything is running smoothly. Now that you are armed with information, it is up to you to decide if the dangers of rocking that nose ring outweigh the benefits.